The acclaimed Top Gun movie, starring worldwide famous stars like Meg Ryan and Val Kilmer, was released in 1986. It also kick-started the now three times Academy Award nominee Tom cruise’s career, and it quickly set itself as a timeless classic. Its characters and story stayed in fans’s minds for years, spreading through generations. The movie’s aerial stunts have received countless positive reviews as well as many technical awards, and it is quite clear that it will always be a must-see for any action movie lover. Introducing the heroes everyone has come to love, Top Gun lets you fly with the cocky, hotshot fighter Maverick, competing for the attention of the elite flying team’s flight instructor Charlotte Blackwood (Kelly McGillis). We all love movie merchandise, and if you’ve liked this movie or if you happen to know a fan, you’ve come to the right place: what’s better than to own a perfect replica of the famous helmets you’ve seen the cast members wear during the most iconic scenes of the movie? Pick your favorite character and/or helmet, make your choice, and fly on. 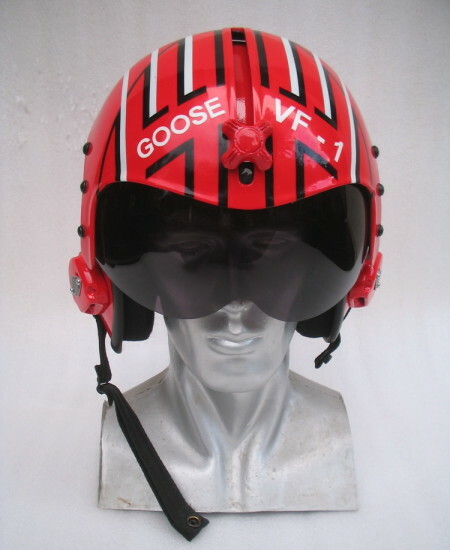 This professionally made F-14 HGU-33 Flight Helmet is a screen accurate, exact replica of Anthony Edwards’s character’s, Nick “Goose” Bradshaw. You might remember the Lieutenant’s helmet thanks to its famous graphic. 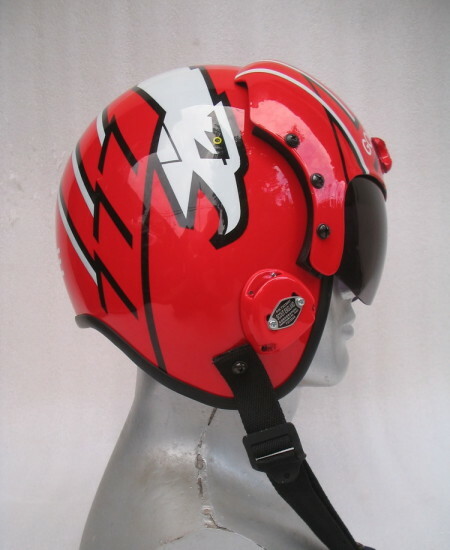 The bright and colorful red, white and black stripes are unmistakable and have been reproduced in high quality up to the tiniest details, like Nick’s nickname on the back, and the black visor on the front. Its creation was particularly meticulous and was done following the design of images taken straight from the movie to ensure precision. It looks exactly the same, and will make anyone believe it is the original one. You won’t be disappointed. It is a must have for any real Top Gun fan, and it’s time to make your colleague, family members or friends jealous! 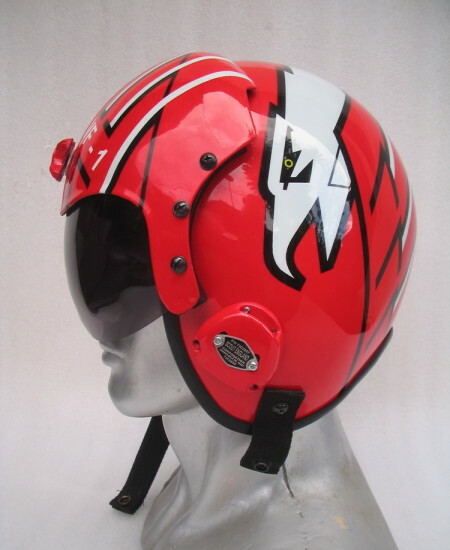 It is important that you be aware the helmet is strictly a movie prop, and that you should not use it for actual flight use, as it is not safe and was not intended for it. It will also not allow you to communicate as you might have seen in the movie, considering it has no built-in equipment for it. Nevertheless, it does comes with comfortable custom interiors. It is indeed perfect for pretending considering its striking accuracy to the movie version. It will look great on display, in your living room, your bedroom or even your office. The product is of high quality and will last you a long time, with no sign of wearing off. 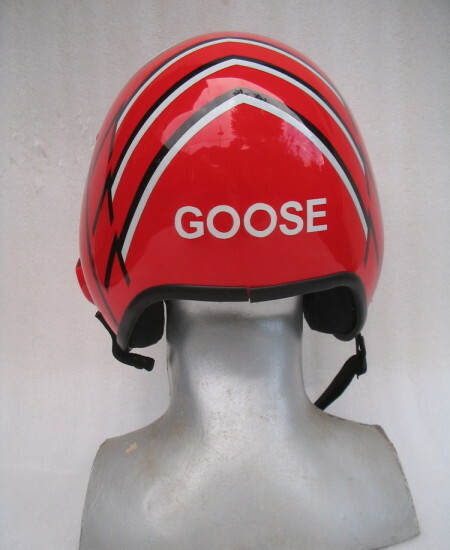 Don’t hesitate a minute longer, and take your opportunity to become the modern Nick Bradshaw the world deserves, with the helmet that comes with the job! If you have trouble picking a favorite, which is completely understandable considering how awesome all these helmets are, or if you want the full collection, every other character’s helmets are also available for you to own, including Tom Cruise’s dark blue one, the memorable Top Gun hero.